While watching Harper’s Island on Netflix last night (no, I don’t know how I started watching this 2009 mini-series either, but it happened; it happens; and at least I’ve moved on from Felicity, right? 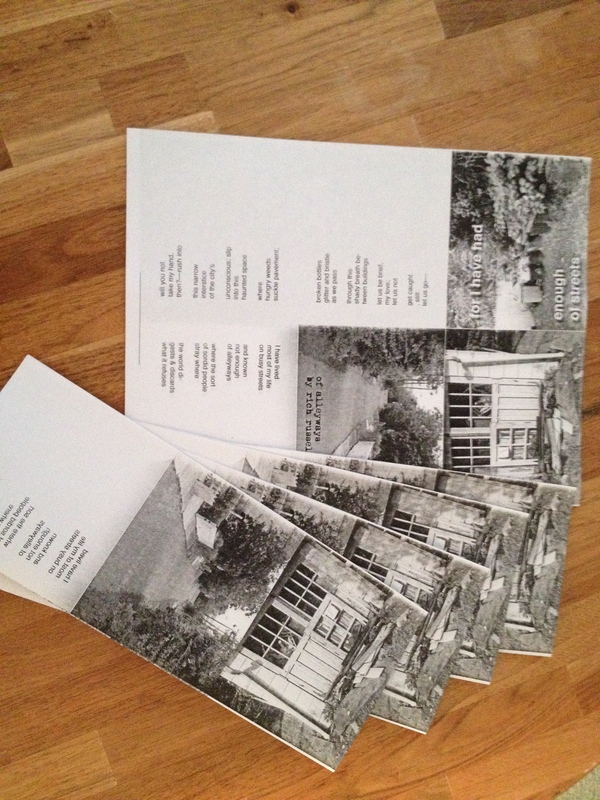 ), I folded/cut/taped/pressed some zines for the alleyways art project that is due––oh, this week. 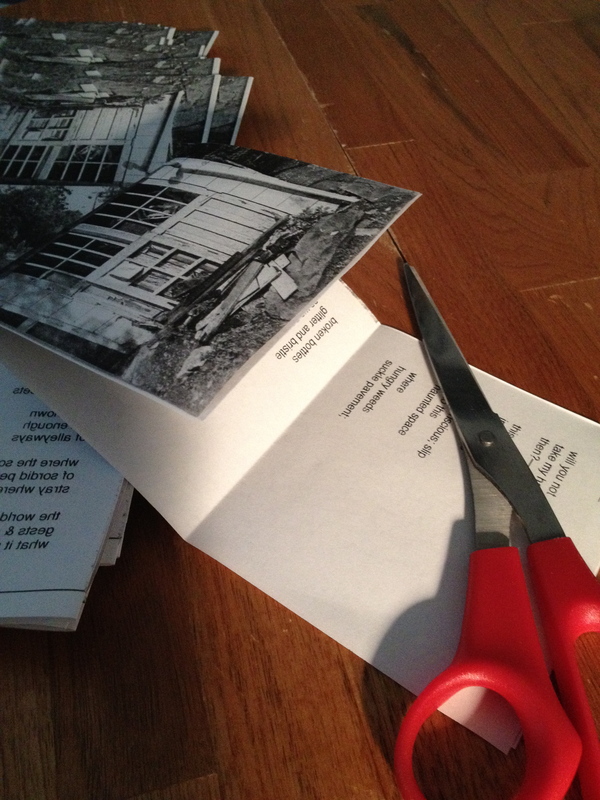 The first zine is super-simple & the one I’ve grown most accustomed to (so I’ll call it “The Rich Russell,” because I don’t know what else to); it just involves dividing a single piece of 8-1/2″ x 11 paper into quarters & folding it up. And the act of folding, you’ll find, is ever so soothing. Step 1. Go forth & lay-out your page into fourths. Step 2. “Fold it up, sport!” This is just like that old Print Shop software I used back in the early nineties to make greeting cards on an Apple IIGS/dot-matrix printer. I was quite the wunderkindish-smash around holidays & birthdays! Wow; I suppose that’s why I’m so affectionate towards this zine format today. This caption-therapy has really been helpful; thank you. Open to reveal a longer work or a collage or full-page spread of something. I know, these pictures ain’t great. Whatever. You might be able to discern: this particular zine features work by my friends Gerri & Maria as well as my rather talkative center-portion. 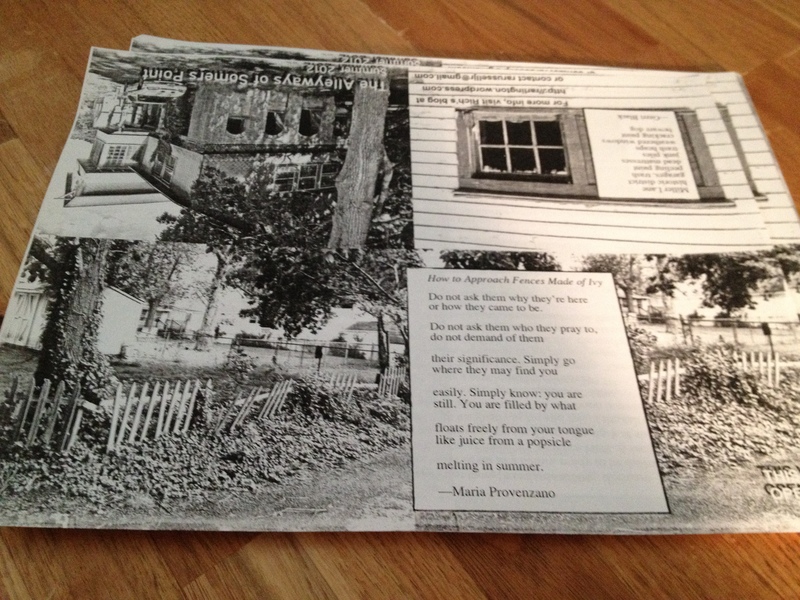 Then, around episode 7 or so of Harper’s Island, I moved on to churning out an accordion zine. This one unfolds into a sort of alley. 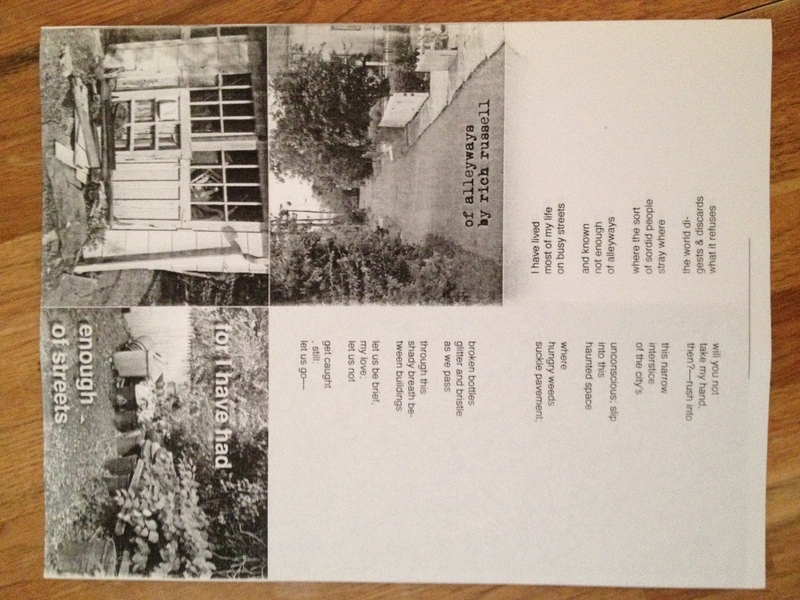 I printed on both the back & front for this one, though you can just go all-fronts if you like. Just have a paper trimmer/slicer or scissors handy & some glue or double-sided tape to fix the hinge where the two sides come together. Step 1. 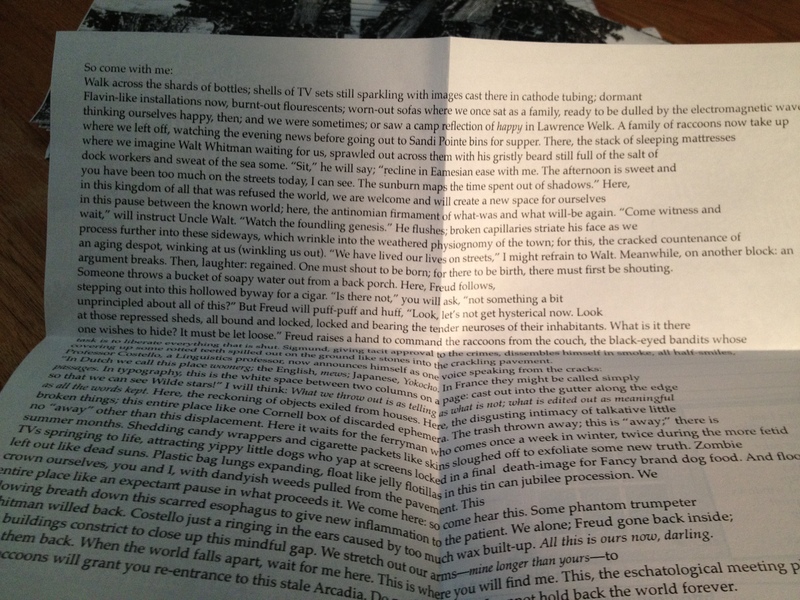 Lay-out your text and image, on the computer or just directly on a piece of paper. Note how the column swings around to the second side as such. Make sure you measure out the number of panels you want on each side. Each panel should all be of the same dimensions unless you want a wonky accordion, which could be rather charming, I suppose, for certain projects. Step 2. I decided to fold in half, first, before cutting. Ohmigod! So much blood! This mini-series might be too much for me! Everyone’s getting chopped-up now! Now I’m even more scared to attend the five weddings I have to go to between now & November!! Step 4. Pull yourself together & FOLD. Step 5. 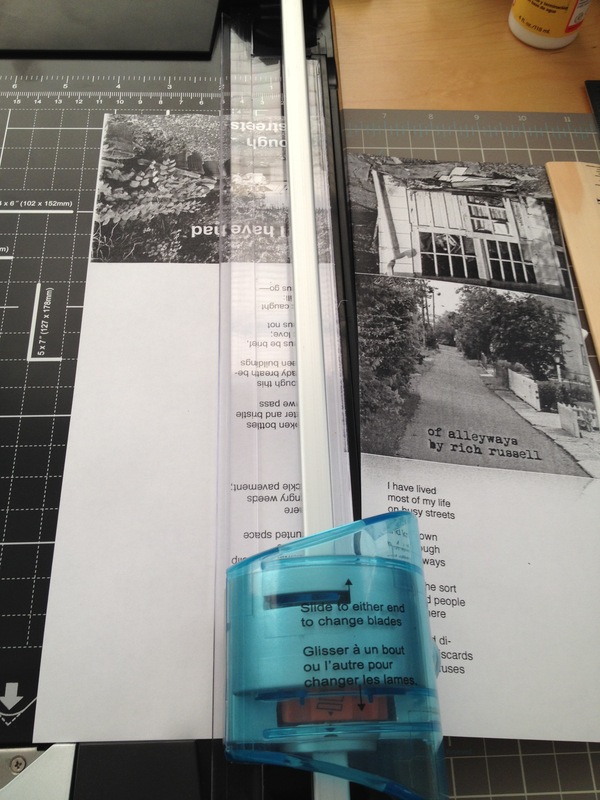 Make sure you tuck-back & affix the hinge; et voilà! 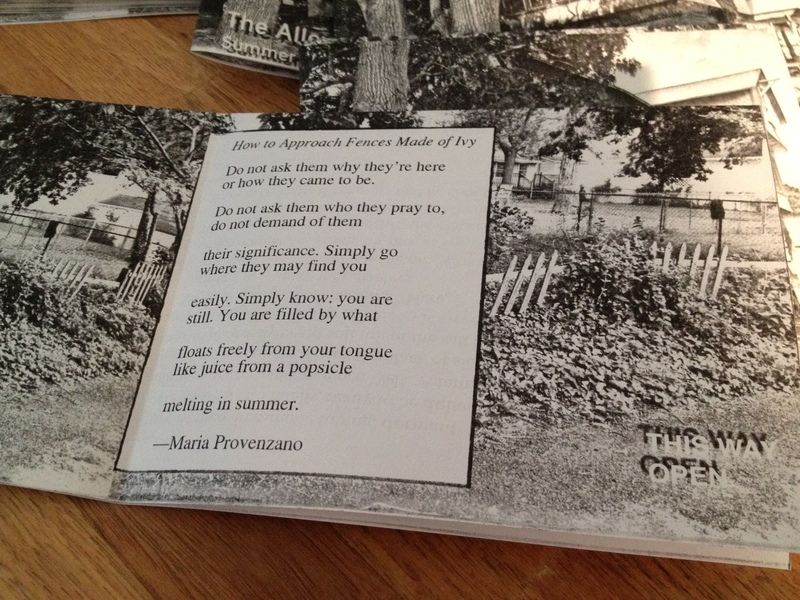 I’m making two more, smaller accordion zines later today for this reception on 8/3. But first!––I have to drive ma mère (Effie) to the doctor’s office. She woke up with her left eye all swelled-up. I received a text message this morning before the farmer’s market: “I can’t see this am. VERY WORRIED.” Effie feared blindness; though right now she’s reading the newspaper. I told her to put some ice on her peeper, thinking it heat-related allergic conjunctivitis, but she refuses any treatment until the doctor tells her what to do. I think that I will need to be the more patient. Correction: It was actually F.E.’s RIGHT eye that was the swelled one. Update: As suspected, allergic conjunctivitis. The patient, like a salty meat, is cured. 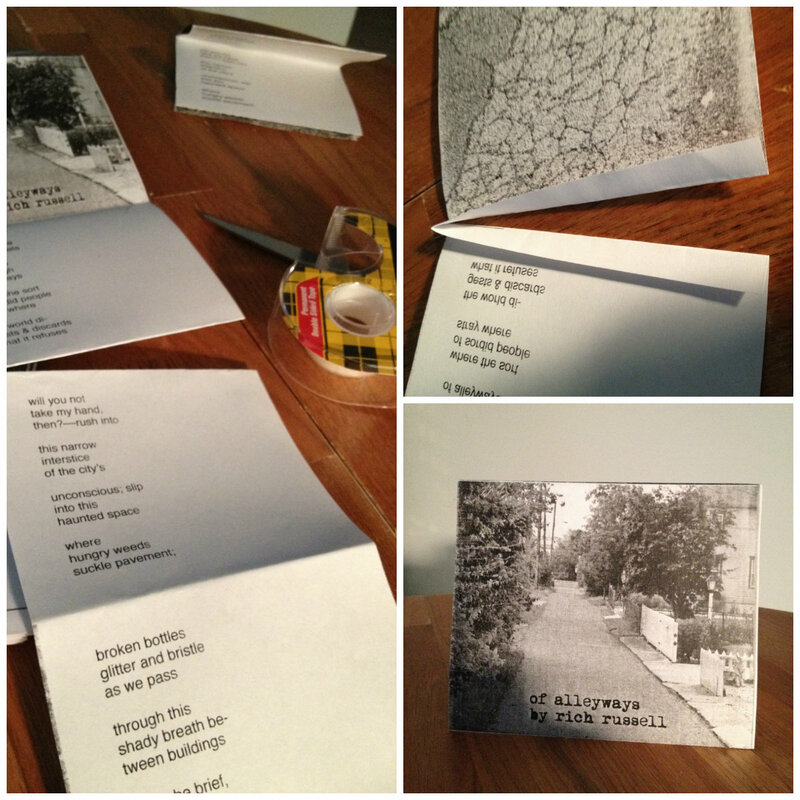 This entry was posted in Alleyways (Summer '12), Bookmaking, Poetry, Summer & All, zines. Bookmark the permalink.